In an earlier post, I said that in Rome, one need only go into a church to see some of the best works of art, and this for free! But for those who like going to museums, and for those willing to pay the entrance fee, there is the Capitoline Museum and the National Museum in the Palace Massimo, but the mother of all museums has to be the Vatican! The Vatican Museums, (yes plural, they say there are 13 museums in the 5.5 hectare complex) , located inside the Vatican City State have to be one of the richest museums in the world displaying an immense collection built up by the Roman Catholic church throughout the centuries. Pope Julius II began the museum in the 16th century when he bought the sculpture of Laocoon and his sons from a vineyard owner upon the recommendation of the great Michelangelo. A month after the purchase, the pope put this statue on display in the Vatican. That single sculpture became the seed for what is now undoubtedly one of the richest if not the greatest collection of art in the world today. 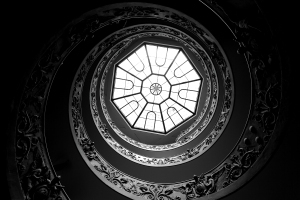 Going to the Vatican Museum can be a challenge. Because I don't like having schedules when I am not at work, I tried going to the museum numerous times without planning ahead, needless to say I was unsuccessful. I would get off at the Ottaviano station and walk through streets lined with shops, encountering tour guides hawking tickets to the museum with the the enticing words "skip the lines" whispered in your ear or shouted at you depending on how desperate the vendor is. I decided to book tickets "and skip the lines" when my girls came to visit us. Skipping the lines is a very relative statement, since you do get to skip the lines at the ticket counters but no one said anything about the lines inside the Museums! But then again, you begin to accept the fact that stamina, patience and determination are necessary if one is to enjoy this visit. Climbing the spiral staircase is the beginning. Once inside, you continue to flow with a current-like tide of people pulling you from one exhibit to the next. There are no names on the pieces, no explanations so you just go on walking looking at one amazing piece and then the next. It is a rather frustrating experience, believe me! With all the money the museum generates, it would seem sensible or at least kind to us poor tourists to spend some of that on proper documentation and identification of these pieces. I bought a book afterwards which lists all the art work in most of the rooms but who can remember all of those after the fact? Or maybe I should have bought the book before I went into the musuem? But who said I was organized? So I followed the crowd, taking pictures (which thankfully was allowed, except in the Sistine Chapel). What was amazing about the Vatican Museum was not only the objects in display but also the decorated gilded ceilings, and ceiling frescoes. Amid all the exhibits, I found a very curious but interesting exhibit of disembodied stone feet, booted, sandalled, barefoot or sometimes just some toes. I made it a point to see the apartments built by Pope Alexander VI, the notorious Borgia pope. (See the posting on the Friar and the Pope). Then there was Raphael's Room, almost as well known as the Sistine Chapel and as crowded. I didn't linger in these areas as taking a picture would mean getting the backs of people and nothing more. I chose to enter rooms that were not overly crowded like the Carriage Room. So called because of the horses and carriage sculpture in the middle? I entered the Pinacoteca, the Vatican's painting gallery. The names found in this collection are staggering, with Raphael, Michelangelo, Da Vinci. Just to see all of these would have been impossible, one may need a whole day, or two just to do this. 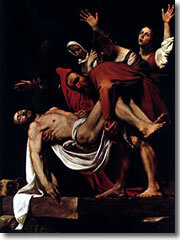 Because I developed this thing for Caravaggio, I went straight to the one I wanted to see, Caravaggio's Deposition. I walked through the Gallery of Statues. And sat in awe looking up at the ceiling of the Sistine Chapel. Amidst all that splendor, there were some pieces, maybe not done by famous artists, that did bring a smile to my lips and a resonating empathy in my soul.